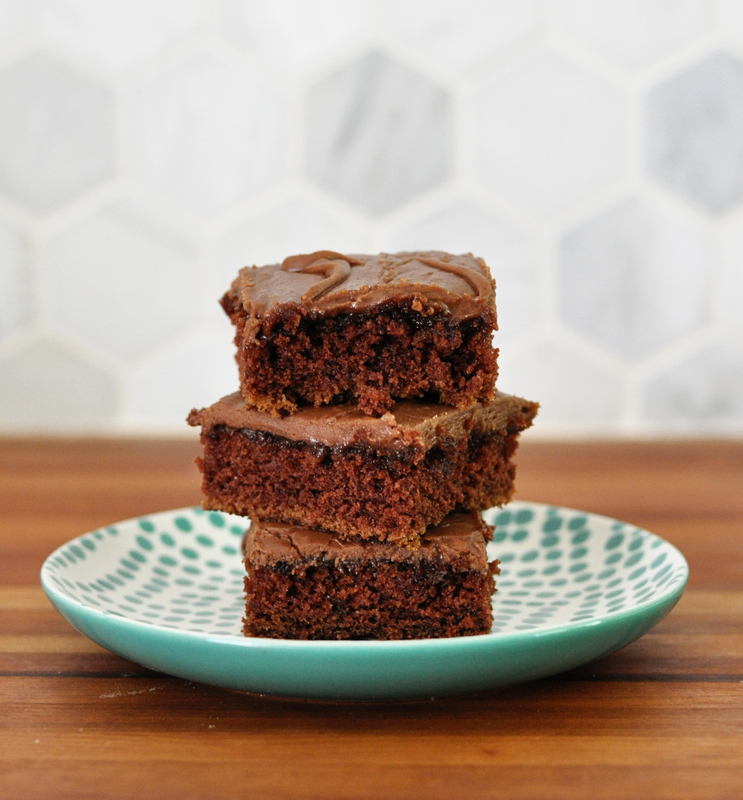 My Mom's Texas Sheet Cake (aka the best Texas sheet cake ever) - Real life, on purpose. 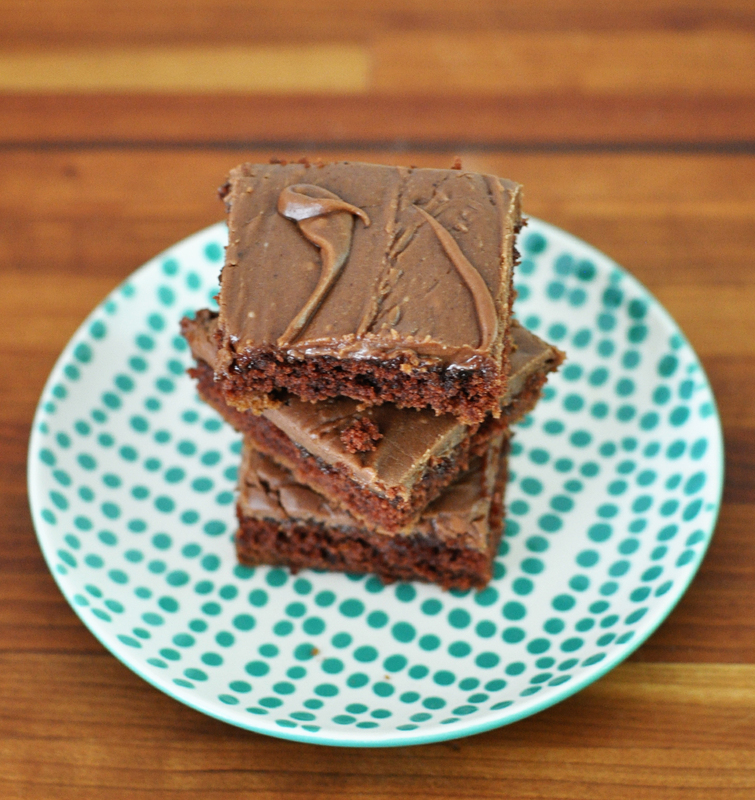 It seems like everyone who bakes has their own recipe for Texas sheet cake. I wouldn’t be surprised to find they’re all the same recipe with maybe minuscule variations. However, because this is my mom’s recipe, it’s obviously the best one ever. It just is. This is one of my absolute favorite treats in the world. I grew up on it. My mom has been making it for years and it never gets old. Since Mila’s birthday was Monday (you’ll hear more about that next week), chocolate is her favorite (despite her insistence on having a blueberry cake at the last minute), and we were invited to our friends’ house for a Memorial Day barbecue, I figured this was a no brainer. It’s easier to transport than a fancy layer cake and it’s BIG. A birthday Texas sheet cake was the perfect thing to bring to a party. I remember trying to make it once for my roommates during my freshman year of college. Turns out something in our kitchen–the floor or the oven–was not level, because the cake came out very lopsided. When I frosted it (with insufficiently thickened frosting, of course, because I had no idea what I was doing) all the frosting pooled in one corner, then dripped over the edges and all over the counter. It was a gigantic fudgy mess. Nobody cared, though, and we ate the whole thing. Even when you make it right, it’s not the fanciest or prettiest cake, but boy howdy is it delicious. 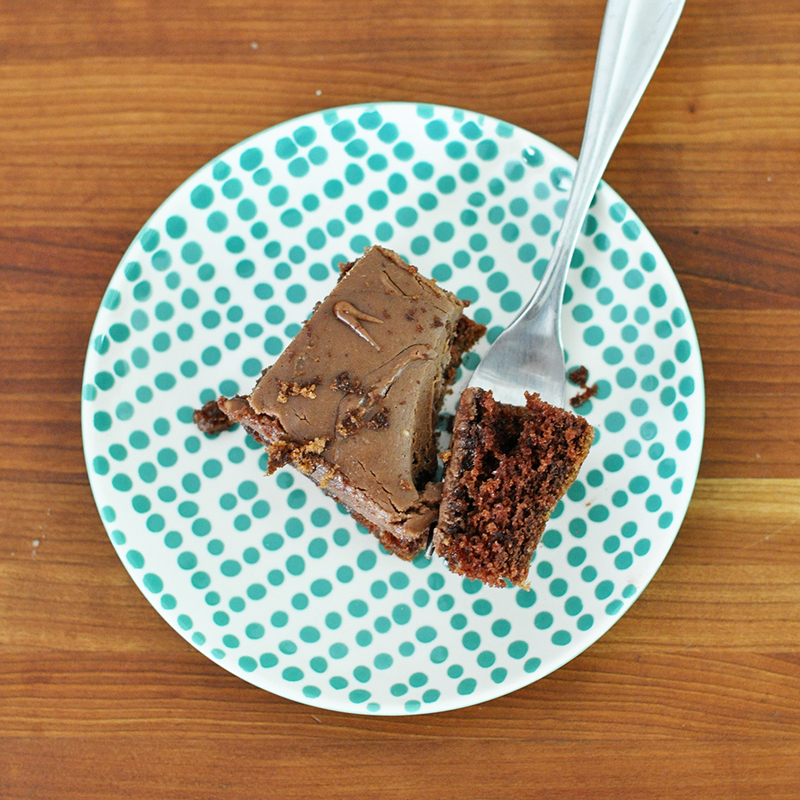 The best part about Texas sheet cake–or maybe the worst part, depending on how much willpower you have–is how easy it is to snitch a forkful. Once you’ve cut into it, no one will notice one extra bite missing. Or another. Or a third. And pretty soon you’ve eaten a one-inch strip the length of the pan. Which is why you should probably only make this when you’re feeding a crowd. Leftovers can be dangerous. Preheat oven to 375. Grease a full size jelly roll pan (18″ x 26″) and set aside. In a large bowl, whisk together flour, sugar, and salt. In a sauce pan, heat butter, water, and cocoa on the stove. Whisk well to get rid of any lumps. As soon as the mixture starts boiling, pour it over the dry ingredients. Beat with hand mixers until combined. Add buttermilk and beat. Add eggs and baking soda. Beat until well blended; the batter will be very thin. Pour into prepared pan and bake for 20-25 minutes. Allow to cool slightly while making the frosting. Pour on cake and spread to cover evenly. Allow to cool before eating or (my favorite) serve warm with vanilla ice cream. 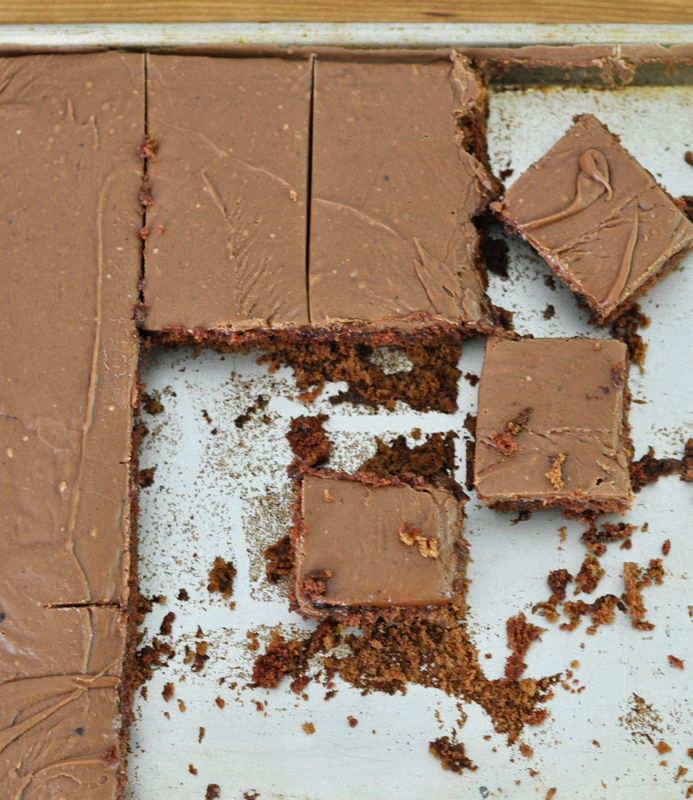 ….I have never made Texas sheet cake. Not once. I find I vastly prefer brownies in the first place…sorry, Jen’s Mom.